Good morning! Well, another week down. Life seems to be moving SO fast at the moment! I have now had my first "week" of Uni (that is two days) and my first two days experience at an early childhood centre. It's bizarre to think this will be my life for three years! It's so different talking to people my own age for a change, I'm so used to working in offices with adults! (okay, I guess I'M an adult, doesn't feel like it though!) I'm trying to get in the habit of writing in my diary now and have also organised my running schedule for training for a half marathon (I know I'm stupid) in October. I've got NO idea how I'm going to fit it all in with study and normal life too! Eek! Now to cake...I know I mentioned this cake in my Cake Fails post but I thought I would share it anyway. For the heck of it! Maybe you can learn what NOT to do! 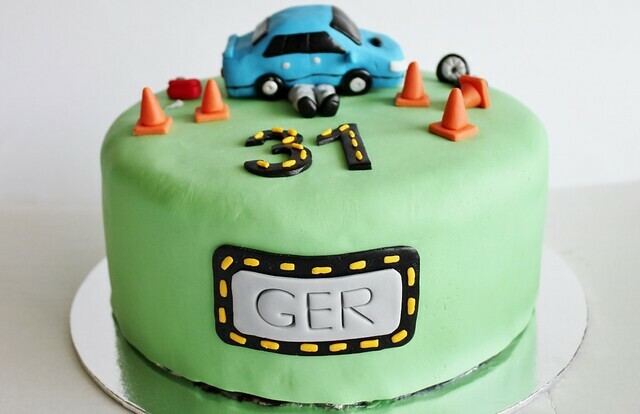 This cake was made for Mr S's brother, Gerald, who is a mechanic and loves his car. He's one of those guys who has a car project sitting in the garage all the time and the car featured is his current one. I wanted to make the car out of LCM's or Rice Crispy Treats as some people know them as, but I had run out so made a trip out especially to get some. Instead of doing the smart thing and buying the trusted brand at full price (which wasn't that expensive anyway) I bought a cheap knock off brand which I later found was nothing like LCM's at all. Needless to say, I couldn't get them to stick together let alone mould them into a car shape so I was stuck with making the car out of gumpaste and fondant. This is something I did not want to do! 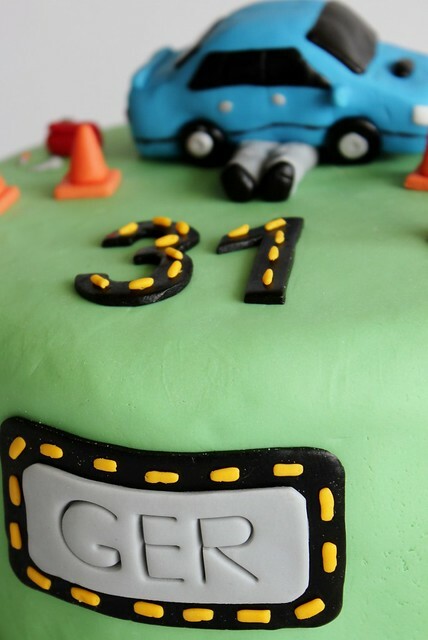 A few hours later and I produced the car you see on the cake. I wasn't happy with it but I had to work with it, no use wasting something other people would probably see no problems with! 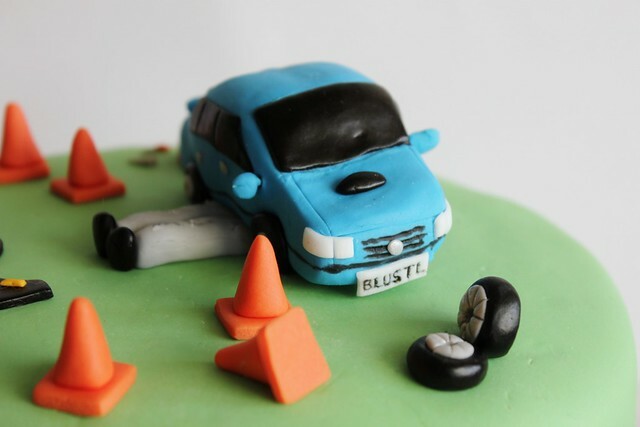 I added a few details like road cones (his birthday present from the family was a stunt driving course). After I added his name and the numbers I was beginning to actually like this cake! 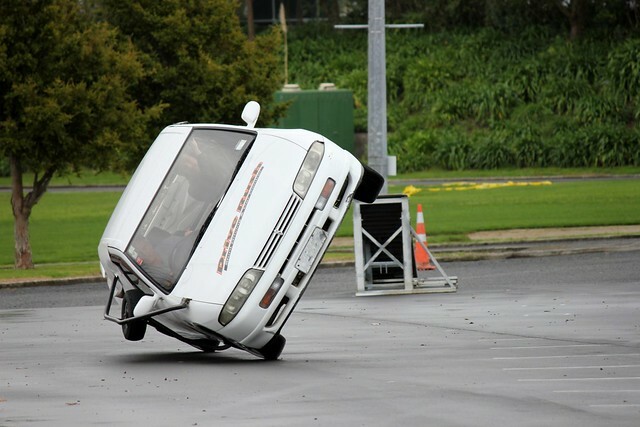 Gerald on his stunt driving course! Haha you are way to hard on yourself -I am in LOVE with this cake! 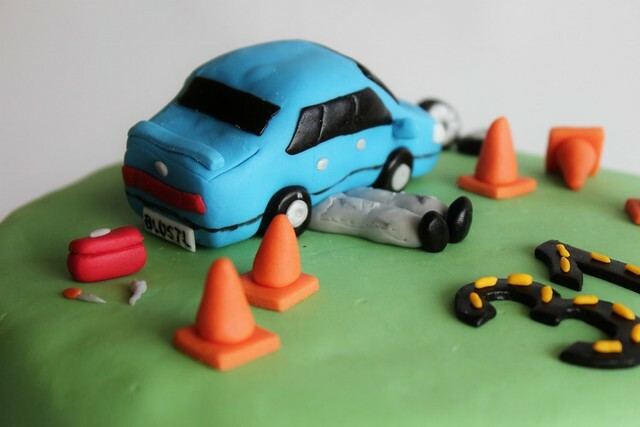 I made a "roundabout" cake for the engineering bake off a few years ago and my cars and cones didn't look anywhere near as cute as yours! Is this your first year of uni? Awh a roundabout cake sounds awesome! Yes this is my first year and first ever time studying -it's such a shock to the system! Not to mention, because I'm working with little germy kids I'm in for three years of getting sick and started off this week with getting a terrible cold! Boo!